The last few days have all been absolutely perfect weather. Hot, sunny, light breeze to make the heat less intense, slight cloud cover, no rain, calm seas... High season is in full swing. The winds are blowing from the North, nights are cool (well, if you can call 24°C cool). 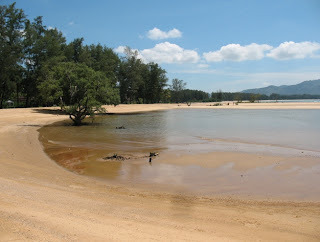 The weather is so nice, there is less need for regular Phuket weather blog updates! You can't 100% guarantee great weather every day, but if you come to Phuket between now and April, you can be pretty sure of sunshine. I was worried that the weather would not last until the weekend. It has a habit of ruining my Saturdays... but today there was no need for shopping in Central. 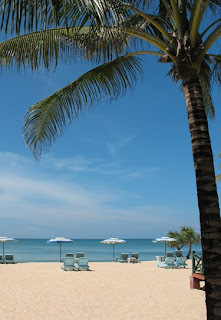 We have been up North to Layan Beach, just North of Bang Tao beach and somewhat off the beaten track. A beautiful spot. The south end has some beach chairs and a small restaurant, the north end is soon to be part of a National Park and aside from a couple of small resorts that blend in quite well (Bundarika Resort and Layan Beach Resort), the area is undeveloped.